Within the Marvel Multiverse is an alternate Earth designated Earth 2149, which contains alternate versions of Marvel superheroes. The story begins as a zombie Sentry crash lands before infecting the Avengers. The infection spreads via contact with the blood of the victim, usually through a bite by an infected individual. The zombie super beings largely retain their intellect and personality, although they are consistently driven by the hunger for fresh human flesh. Torn from the pages of Ultimate Fantastic Four! On Earth 2149 shockingly similar to the Marvel Universe’s, an alien virus has mutated all of the world’s greatest super heroes into flesh-eating monsters! It took them only hours to destroy life as we know it—but what happens when they run out of humans to eat?!? Follow their search for more food—and witness the arrival of the Silver Surfer! 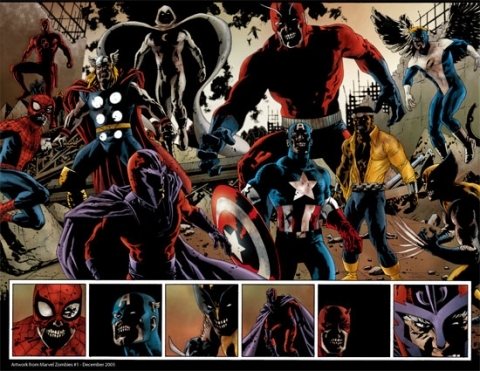 In the reality of Marvel Zombies, Magneto and his Acolytes were a few of the survivors following a plague that caused an undead-like effect in “super-powered beings”. It is revealed in Marvel Zombies: Dead Days that he and Fabian Cortez made a deal with an unknown entity from another universe to damage the Earth to let mutants become the dominant force. Though they believe it is the zombie Sentry, the zombified Reed Richards later hypothesizes that it was with an entirely different universe unrelated to the zombie plague, and that Sentry’s arrival was a coincidence misleading Magneto into believing he had led to the Earth’ ruin. Regretful that he has doomed the entire planet and his Acolytes either dead or having retreated to Asteroid M, Magneto returns to earth to help any non-infected beings left. He eventually hides out with a small group of human survivors, a female cop, a lone father and his daughter. He saves Ultimate Reed Richards from the Zombies and brings him to their hideout, a subway station. Magneto acknowledges the irony of working with normal humans, but believing that “Beggars can’t be choosers when you’re down to the last few people alive”. Magneto learns the zombiefied Fantastic Four of his reality had tricked Reed, in a plan to allow the zombies to cross to Reed’s universe for more victims. Reed and Magneto work together, first getting diabetic medicine for the young girl, then taking the civilians back to the dimensional teleporter that Reed had emerged from, although they require the aid of the rest of the Ultimate Fantastic Four to do so. After Richards escapes with all three of the civilian survivors and his teammates, Magneto stays behind, not wanting to die but acknowledging that he is the only one capable of destroying Richards’ dimensional transporter so that the zombies won’t infect Earth-161. Magneto destroys the device and flees from the zombies. He is contacted by the Acolytes in Asteroid M, who offer to send a shuttle down; Magneto, however, refuses to let them risk infection, and says that he will find a way up to them somehow. As the battle with the zombies takes place, Magneto decapitates the zombie Hawkeye with Colonel America’s shield. He attempts to decapitate the Colonel as well but only succeeds in slicing off the top half of Colonel America’s brain. The latter becomes very annoyed at this, demanding double rations when Magneto is caught. Magneto is soon confronted by more zombie hordes, whom he only destroys but with little success as result of them being undead, and prepares for a final showdown. He drops many of them with a rain of metallic debris, but is swiftly bitten by the zombie Wasp. Magneto is pounced upon and devoured before turning, his last words being “I hope you choke on me!” just as Thor and Hulk tear him in two as the rest of the group descends upon him. In this universe, Frank takes advantage of the fact that the heroes and law enforcement officers are busy with zombies and he hunts and shoots down the super-villain leadership of New York City, known as the Kingpin, The Owl, and Hammerhead. Along the way he allies himself with Ash Williams, who he intends to help battle the zombie threat. When Ash sees him kill the still human criminal trio he becomes disgusted and mistakenly abandons the Punisher minutes later. This leaves Frank to be attacked and infected by a squad of zombies, causing him be at first “killed”. Frank returns as a zombie and turns Ash’s ally, the Scarlet Witch into one. After that, in disgust, he was killed by Ultron using one of his own guns. However, another alternate version of the Punisher appears in Marvel Zombies: Evil Evolution, he appears zombified along with other zombies attacking the Marvel Apes. EARTH ZERO: A universe that resembled our own, visited by Howard the Duck and Machine Man while trying to collect information about the Zombie Virus. EARTH 483: A universe that resembles the American West during the late 19th century. Howard the Duck and Machine Man of Earth-616 collected samples from Type-6810 Ghouls that had infested this Earth. EARTH 666: Alternately called the Necroverse, it is populated almost entirely by various forms of undead and ‘classical’ monsters, including the Avengers of the Undead (who “heroically” defend against life itself) and the Undead Celestial, which rules over them all. EARTH 2149: Also known as the Zombie World. A universe where an infected Sentry (Robert Reynolds) from another reality transmitted a virus that turned all costumed heroes into evil, cannibalistic zombies. 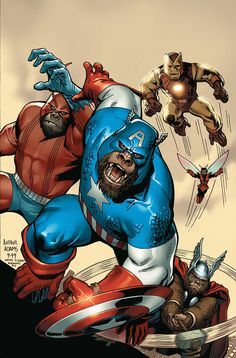 Earth 7085: A universe where many of the Marvel superheroes, other than just Man-Wolf, have been infected by an alien virus that transforms them into flesh eating werewolves at night. EARTH Z: Its revealed the remaining zombies of Marvel Zombies 2 like Spider-Man and Wolverine were teleported from New Wakanda to separate locations of this universe. Eventually this universe is also taken by the Zombie Virus. Home reality of the zombified Sentry who took the infection to the original Marvel Zombies reality.